Laguiole is a magical place. The landscape and setting of Laguiole is so much a part of the cuisine. It is just breathtaking to sit and watch the countryside change and unfold with the burning sun and then the emerging stars. 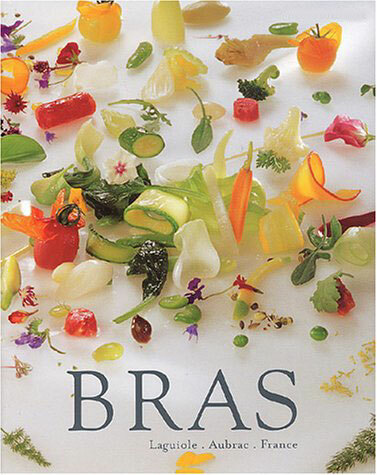 To say Bras is absolutely gorgeous is a massive understatement. We were shown to # 11, our favorite room is the last room. 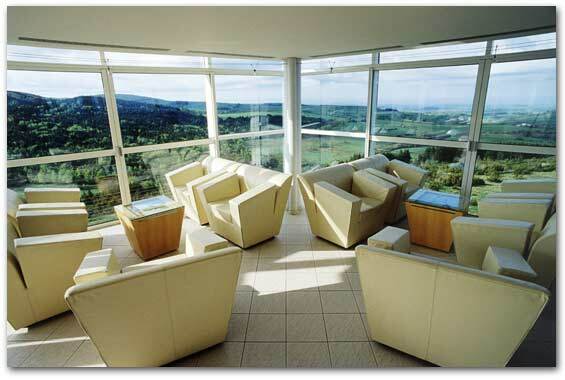 It is named “Space d’Aubrac”…huge picture windows provide a breathtaking view of the country-side—absolutely magnificent. By 8:00 we were ready for deux coupes de champagne. We were seated in the lounge with a different, but equally wonderful, view. Amuses were the signature Bras dishes. A perfectly cooked soft-boiled egg served in its shell, with a bottom layer of deep brown mushrooms jus (I think),accompanied by a rectangular bread stick made with whole grains and covered with seeds. 3. beef gelee consommé with saffron. Our favorite was the quinoa—more for texture than taste. After ordering dinner and wine,we were shown to a lovely table by the window. As the evening progresses you watch the country-side glow in the setting sun. Later the ceiling lights up with images of wind-blown clouds. Le Gargouillou of Young Vegetables—this is a dish that has been described ad infinitum, but regardless, it is an unbelievable medley of 30/40 vegetables, each cooked separately. Additionally, there are all manner of leaves, herbes, and flowers strewn over the plate. Finally a thin slice of smoked ham or bacon. Then 7 vegetable purees were added, ringing the plate. Each vegetable has its own taste and texture. You marvel at the complexity of the dish. When the first dish was presented, the younger Mrs.Bras also advised that the beautiful, custom Laguoile knives would not be replaced with the removal of the used dishes. silver holder provided for the knife (dirty) and a clean spoon and fork. Actually ,a beautiful, rich presentation of utensils that are fine art. Duck foie gras pan-fried in a bullion of “pomme de terre” (potato) garlic and sorrel. The foie gras was like nothing we have ever tasted. In some respects it resembled the warm Tourchon of Foie at The French Laundry—but it was so compact that you could cut the foie into 1/16” thin slices. As for texture, it was firm yet creamy and soft and it melted in your mouth. The accompaniments were lost in a blur of flavors. This course was billed as “from the North and the South”. Four green asparagus spears from Roussillon were served with a black truffle butter. Good, but by this point we were feeling veggie overload. Roasted saddle of Lamb on the bone from Allaito served with vinaigrette of mache and vegetables l’agastache. Cheese—not a large variety, mostly local cheeses, but served perfectly. We wimped out on desserts. absolutely a beautiful place and the Gargouillou worth the price of admission. The younger Mrs. Bras could not be more cordial. We had a long conversation about children and the restaurant business. Next day we ordered breakfast in the room – an absolute must. Michel Bras sends a wooden basket decorated with flowers, a thermos of coffee, juice, creme caramel, honey, jam, bread, pastries, another basket of specialities of Laguiole, a cake filled with fruit, yogurt with strawberries and cheese.